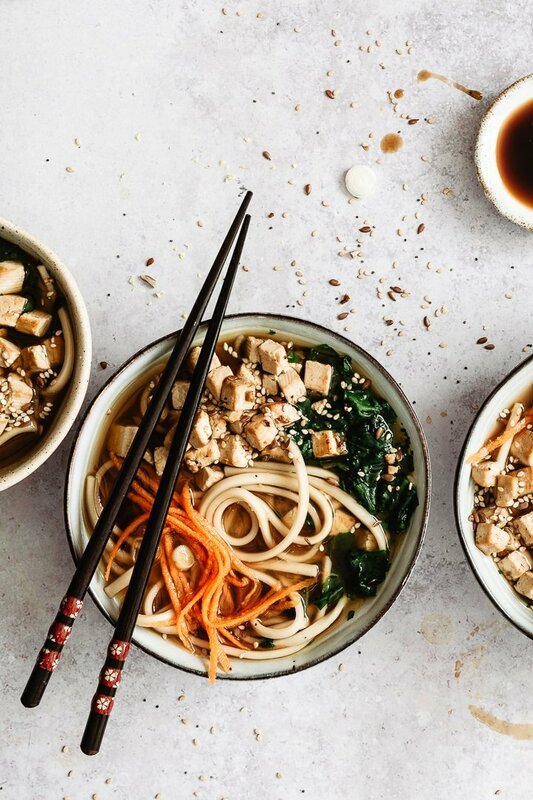 You read the title: this vegan noodles soup is easy. And if I say easy, you can trust me, IT IS. I’m not an expert on soups and ramen/noodles soups, in fact I’ve always hated soups. To be precise, I’ve always hated minestrone soups and chicken broth. And YOU will probably end up loving soups as well, if you try it! P.S. isn’t it perfect for these cold Winter days? I’m thinking about you American friends: I mean, – 40° C?! Oh gosh, you need this recipe. Serve your udon noodle soup with julienne carrots to give a touch of color! THIS vegan noodles soup with barley miso and my fails. 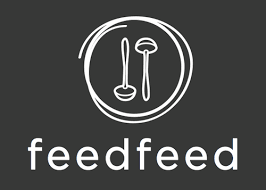 I mentioned it many times here on the blog: I usually work all morning and all afternoon, so when lunch/dinner time arrives I need something quick and easy. This soup is not extremely quick (the good news, though, is that you can prepare it in advance), but it’s definitely easy. You’ll see it has quite a few ingredients, but don’t be scared: they can be found easily. Less Sodium Soy Sauce, Barley Miso and Udon noodles can be found in ethnic stores or organic grocery stores (if you’re lucky also at the supermarket). If you can’t find them, order them online! 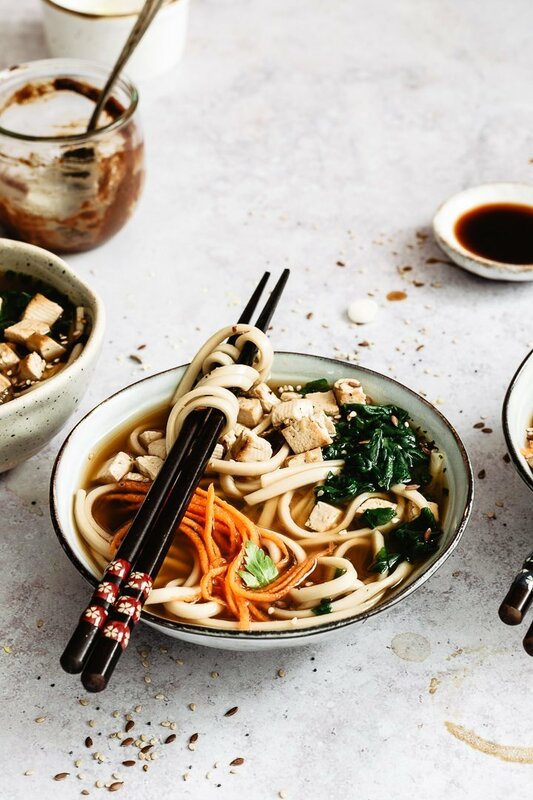 When I decided to make a noodle soup for lunch a couple of weeks ago, before actually making it, I searched for a few hours on the Internet and read so so many recipes. 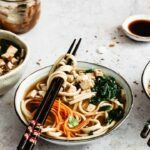 You can find millions of noodles soup recipes out there, but the majority of them is made with chicken (or other meat) broth. Chicken broth probably does all the job because it gives so much flavor and it’s packed with benefits. But, as mentioned above, I don’t like it, and if I eat chicken is just because “I have to” (we have a complicated relationship). So, I opted for a veggie broth. See that tofu? The flavor is a combination of sweet, savory and spicy! Delicious! Regarding the rest of the soup: you could (and should!) have fun and experiment with different combinations. Try adding boiled eggs, for example, or other kinds of vegetables. Lastly, I’d like to make a criticism (to myself): I don’t feel like calling it ramen, that would be an insult to the real ramen, which is made of meat broth and a combination of flavors/toppings. This is “just” a vegan miso soup with noodles, and it’s “just” my version, but I promise it’s goooood. I know what you’re thinking: You said you’re not an expert, so why are YOU telling US how to make a noodle soup? Well, I’ve tested it and failed and now I want to share the main tip to make the perfect soup: the broth. As my online friend Chiara (@mangioquindisono) told me once, the broth is the key. If you want an amazing soup, then you need a superb broth (which is quite obvious, in hindsight). even if you add soy sauce to the tofu and miso to the soup, you have to salt the broth otherwise it will be flavorless. you don’t have to be afraid of adding a lot of miso, but taste it before adding too much. …taste and adjust according to your preference! It seems complicated, but once you have your good broth, it’s basically all done! My version of udon noodles soup is extremely easy, but so delicious and flavorful! Try it! First step, to create an amazing noodle soup, is the broth. In a deep pot pour the water, with peeled onion (no need to chop it, you can cut it in half), peeled carrot and celery. Bring to a boil at low/medium heat and let it simmer for 20/30 minutes. While the broth is simmering, prepare the tofu: drain it and dry it. Chop it. In a bowl, combine soy sauce, minced ginger and sugar. Let the tofu marinate for 20/30 minutes. When marinated, cook it in a pan - with a bit of oil - at medium/high heat until the surface is golden brown. Set aside. Parboil the spinach for just a few minutes (3 minutes are enough) in a pot with a tiny bit of water. Drain. Follow the instructions on the package. I cooked mine for 14 minutes in the broth. Turn off the heat. Lastly, add the miso: dissolve it in a bit of broth then add it to the broth itself. 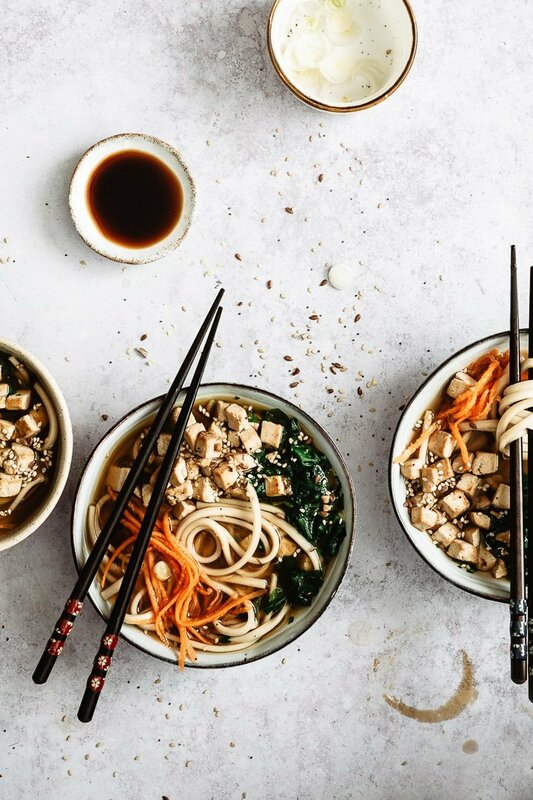 One thing I've learned from my friend Alessandra (here's her website): do not add the miso to boiling hot liquid otherwise it will "kill" the probiotics. Assemble the soup: pour the broth and noodles into two bowls, add parboiled spinach, chopped spring onion, julienne carrot, some more ginger (if you want) and the tofu.